With the bedroom completed I wanted to move on to adding Farmhouse charm to our dining room. Mr. Front Porch was not on board. 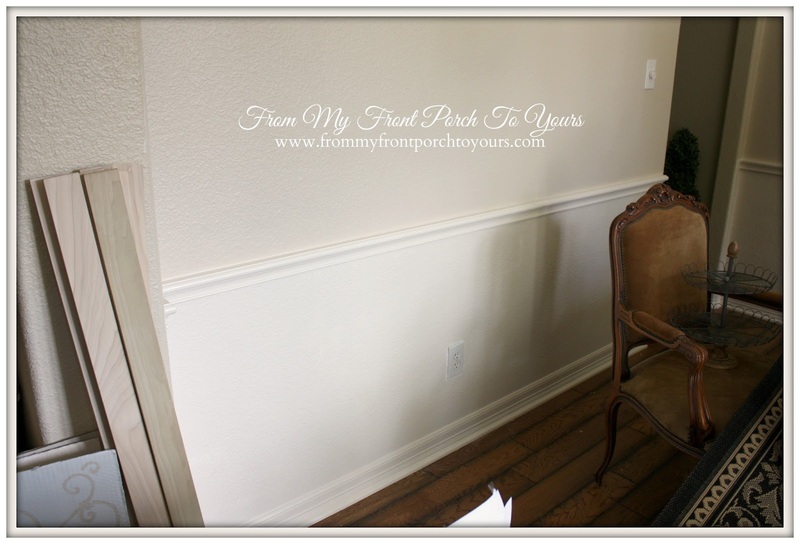 He thought the dining room was just fine so I was on my own for this makeover. 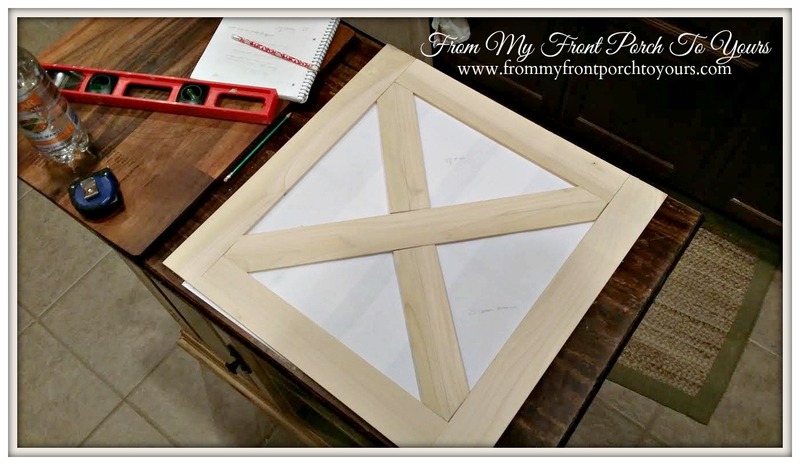 I chose to create a Crossbuck design commonly referred to as a Barn Door design. 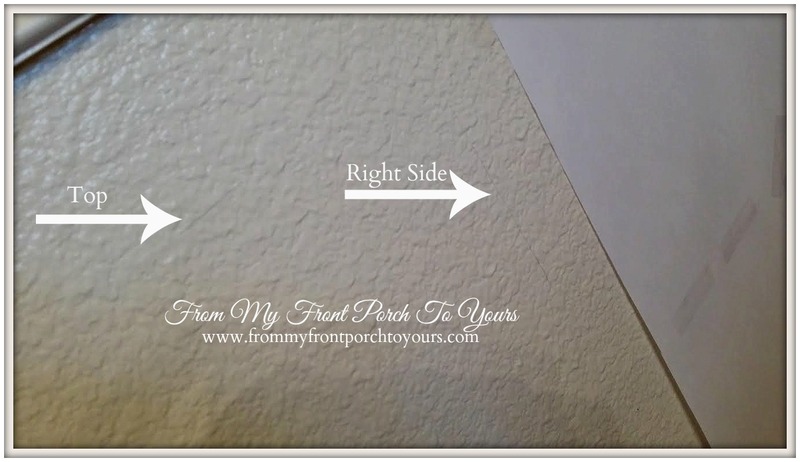 The walls were recently painted with Sherwin Williams Maison Blanche and the bottom freshened up with some white. Next up I created templates for my design with just some printer paper. I went with 22 inch squares for our space. 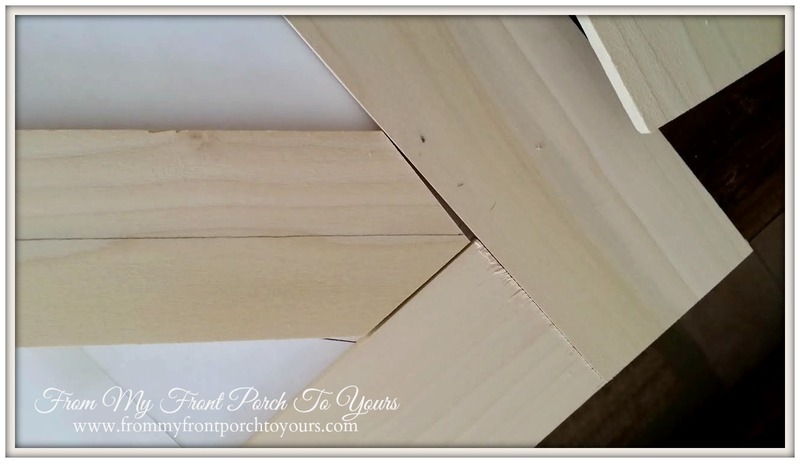 To create the squares I used 1/4 3X4 Poplar boards. These you can purchase at Home Depot or Lowes. I chose Home Depot because they were $3.07 a board where as at Lowes they were over $4. I used approx 3 boards for each square. Because of this it took a few weeks before I had enough boards to complete the entire space. They do not keep a large amount of these boards on hand at one time. 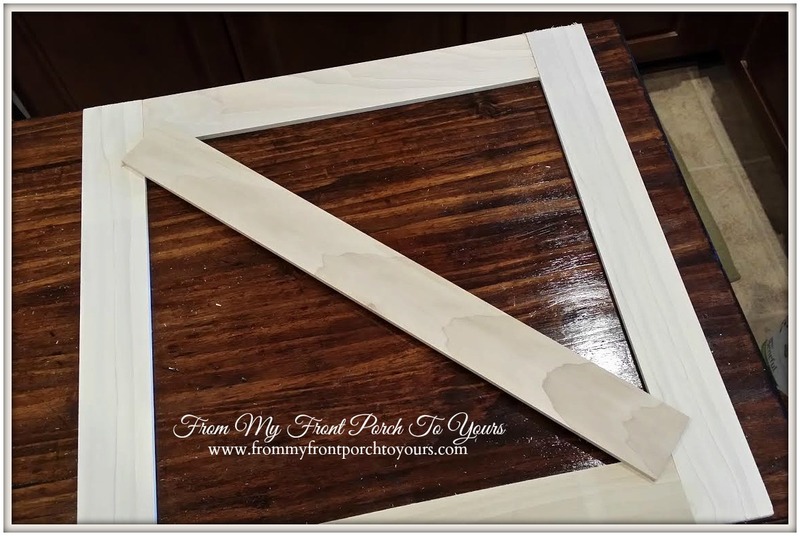 I am sure I probably could have asked them to order me what I needed but it gave me time to figure out exactly what I was doing.Now a VERY important part of this project is the fact that I had ZERO experience with wood working! That is right none what so ever so if I can accomplish this project on my own so can you. 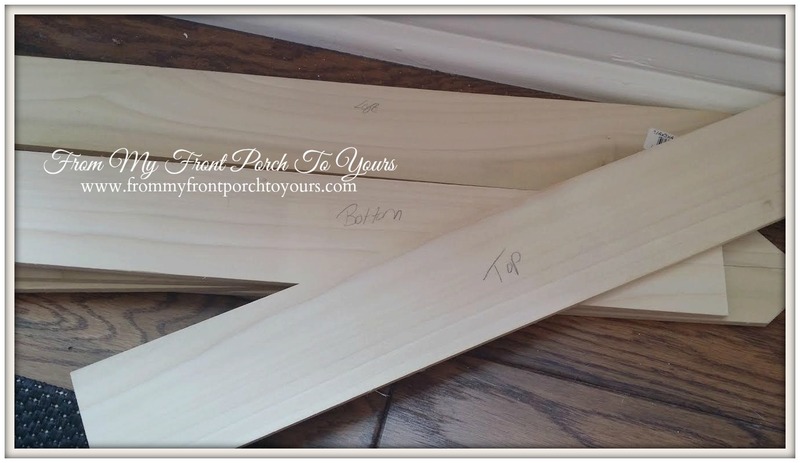 I used Mr. Front Porch's miter saw to cut my boards. 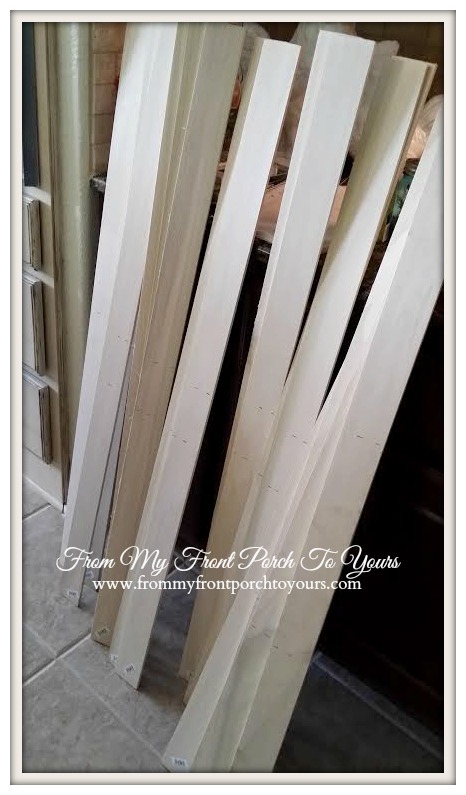 The side boards are 22 inches long and my top and bottom boards are 17 inches long because I needed to factor in the width of the boards to equal 22 inches all the way around. Next up was to create the center board of the design. I lined up the center of the board to each of the corners and marked where I needed to cut them. You can draw a center line if you want to down each board but after the first one I just started guesstamating the center and it worked out just fine. I made sure my pieces all fit together on a flat surface. Not bad for a beginner! ;) Make sure to follow all safety precautions like wearing safety goggles when cutting your boards. Be sure to sand all your boards down smooth before installation. Some of them may be rough to the touch. Something I found quite helpful was to label your boards and keep them in sets. I cut each board design one square at a time to make sure all the pieces would fit together. You could technically just cut all the boards at once but to me that leaves a larger window for error. After my squares were cut before I took down my templates I marked the top and bottom where the starter boards needed to line up. 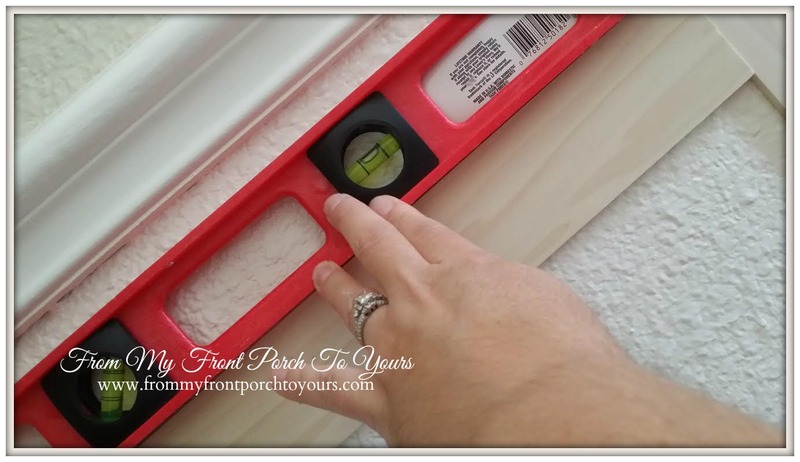 This made life super easy when installing the boards! Every now and then bust out the tape measure just to double check your work. I used a level to make sure all my outside boards were level. The boards went up super fast! I just used our nail gun to secure them. You may want to add adhesive but I chose not to in case I decide one day down the road I want to take it all down. Next up I used joint compound to fill in all the nail holes and slight gaps. 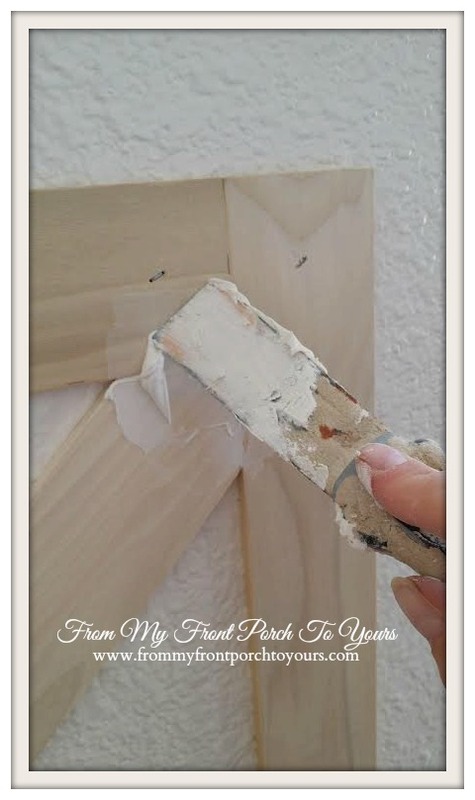 Be sure at this point to make sure your nails are flush with the wood. If not use a nail finishing tool to make them flush. After everything was filled in I sanded the joint compound off and starting caulking. The caulking is what took me the longest and was the messiest. After caulking was completed I used a paint brush to paint the inside edges of the design and then a wide foam brush for the rest so I would not see brush marks. To add to the overall design I took down the basic outlet covers and purchased these more decorative ones at Lowes. I felt that looked more custom and built in to the design. I am just loving how the project turned out! It was exactly what this space needed and I can not wait to show you all the entire room. I am working on a few more projects though for this space so be sure to keep checking back! Awesome!! Thanks for sharing your projects! WOW! I am really impressed! That turned out wonderful. I love it! Wow, Pamela ... looks amazing! You are quite talented with a saw! It gives your already fabulous dining room another layer of awesome character! Great job! Impressive Pamela--you did an amazing job and it looks FAB! Wow, Pamela! I am so impressed with your handywork. 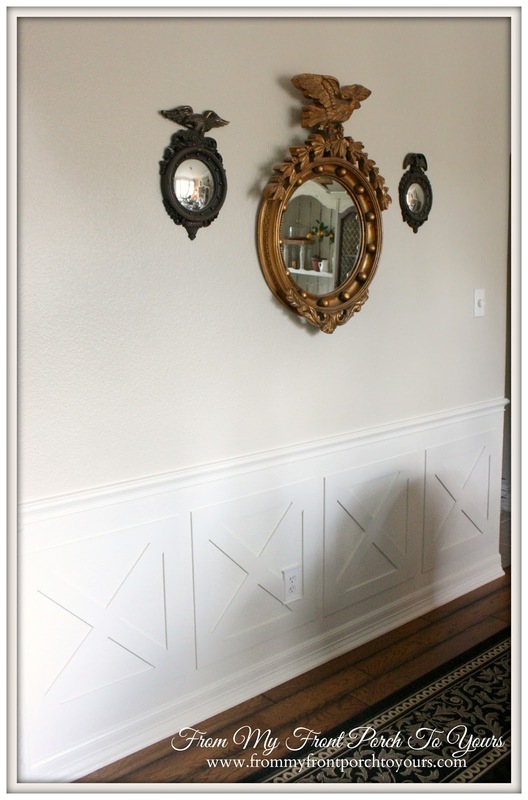 The wainscoting looks fantastic! WOW!!! You are amazing with that saw Pamela. Hats off to you lady! LUV it!!! Farmhouse FAB indeed. Can't wait for the reveal. Beautifully done Pamela...I love it! This made your wall look like a million bucks! Love it Pamela! Super wow. I am totally impressed. This looks amazing. Good for you and a fabulous tutorial too. Awesome! And you make it look so easy! You did a great job! Looks great, Pamela! You are so brave to tackle such a big project but you certainly pulled it off. This project came out great! 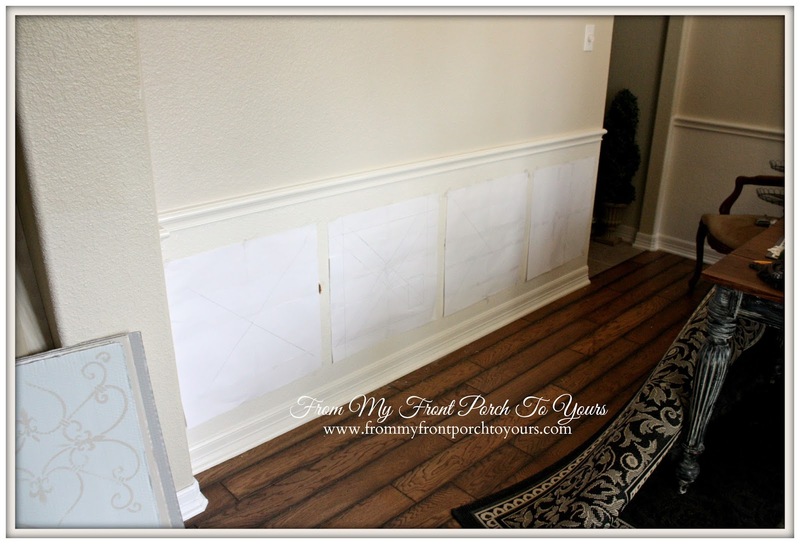 Such a unique idea too add to a dining room wall. Wow, Pamela, this looks great! 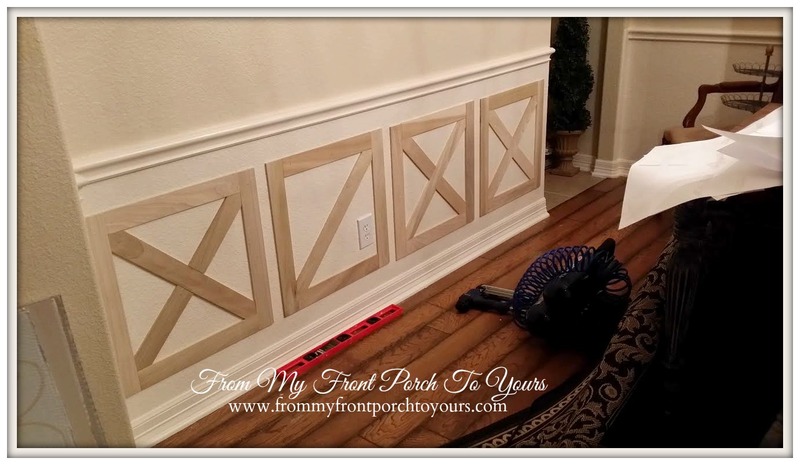 Such a custom job...it adds so much depth to the wall! You should be quite proud of yourself! It turned out amazing!! I love it and I am super impressed with your skills! Wow, Pamela, you go girl!! Pamela - Beautiful job! But how did you do the socket? You didn't say adn I noticed in all the pics, the socket went right thru the boards...elp?! It is lovely! Sara I measured the board where the socket was as if the socket was not there. Then once the board was cut to fit I took the plate and placed it on the board where it would fall and traced around it and cut. On two of my outlets the bottom half of the board is actually two pieces that were filled in to look like one. If you have a jigsaw and helping hands then you can probably cut it and leave it as one piece but that wasn't happening with just me. The sockets were the hardest part but thankfully I only had difficulty with two out of the four. One fell outside of the design and then another was just a simple cut. This is very impressive Pamela! It adds so much character to your dining room. Can't wait to see what else you have in store for this room! I am so impressed! It looks great. Mad skillz, girl. Looks so fabulous Pamela! What a difference it makes to your dining room. 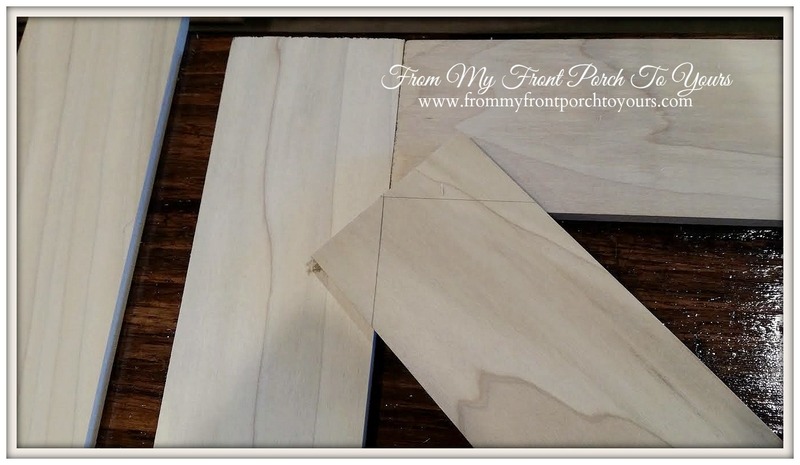 I just used those poplar boards for the shelves in the medicine cabinet we are making for our mountain cottage. 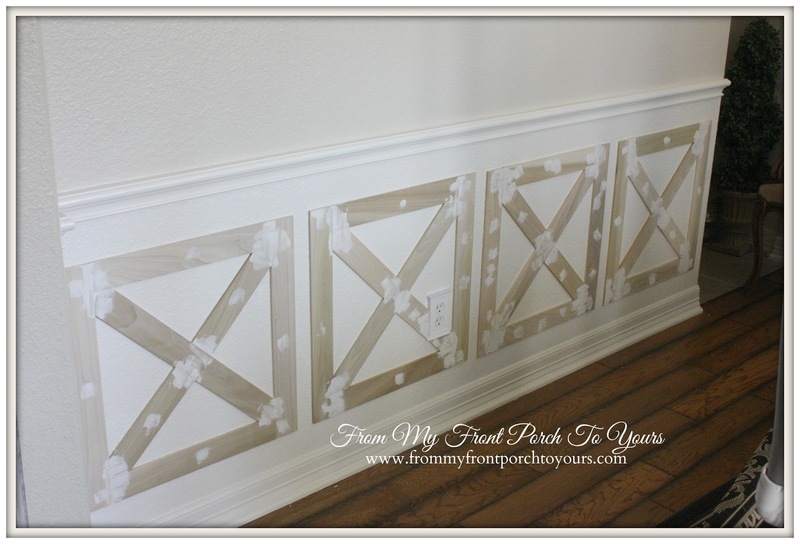 This looks wonderful, Pamela, and it adds such a truly unique touch to your home. Love it! This is so great! Love it!!! Thanks for sharing! 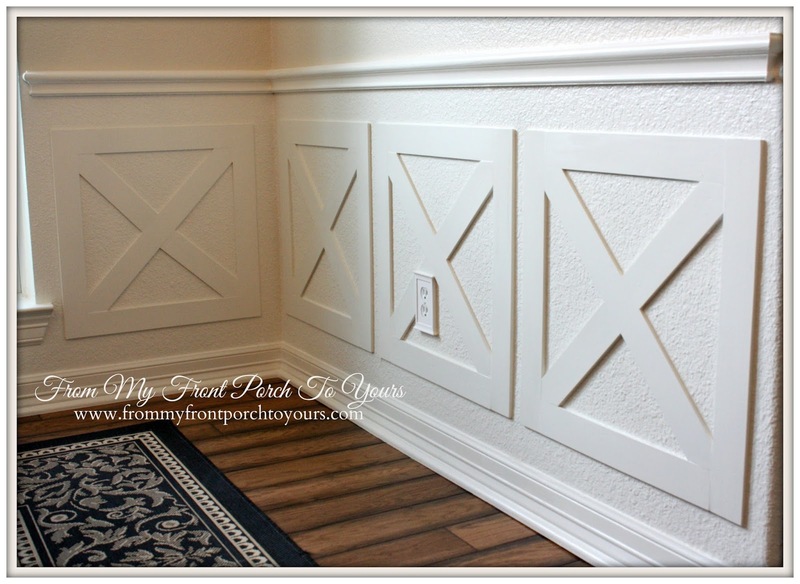 I love moldings of any kind but this has got to be my favorite! You've got me rethinking my plans for the upcoming kitchen reno! This really turned out well. It's hard to believe you had no prior experience and I know your husband must be pleased after all. Wow Pamela, you did a fabulous job especially for someone with no experience. It looks so professionally done. You did a wonderful a job. I love the way it turned out. You probably also saved yourself a huge chunk of money as well doing it yourself! Look at you! Way to go girl, and thank you for the tutorial. I think I could do this! Now, I just have to find a new home to do it in. First I just want to say you are a RoCkStAr!!! yes you are!! It looks amazing!! Wow! Its gorgeous! I look forward to seeing you at My Dream Canvas. 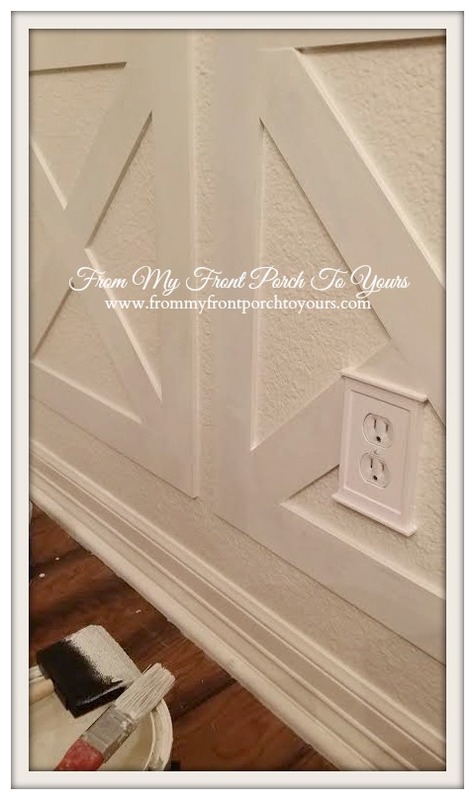 Fabulous post and fabulous wall treatment not to mention a great tutorial. That looks great!! Love the Barn X detail on just about anything! Love, love that look and you did an over the top amazing job!!! This is just awesome. I love this. Great job. Looks beautiful. You always amaze me with your fabulous ideas! 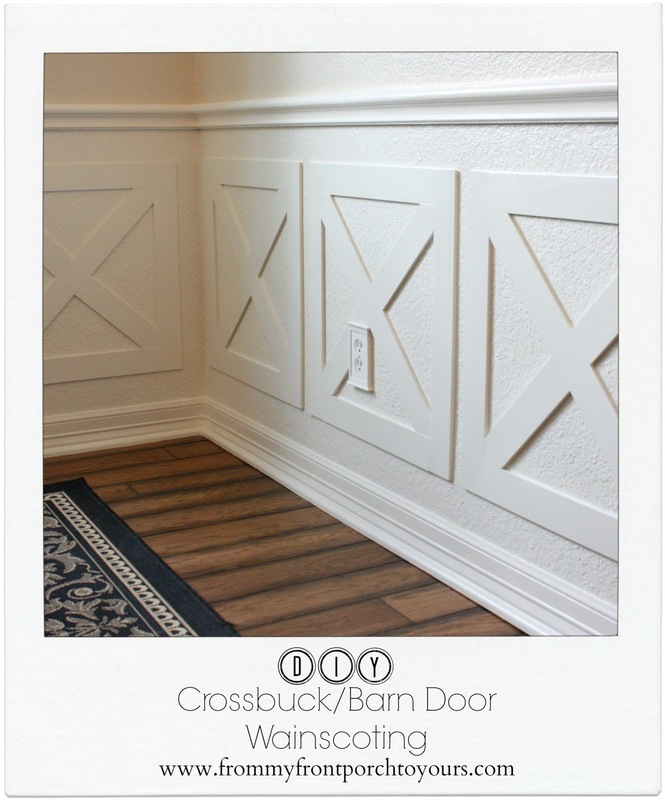 I love the Crossbuck trim! Your dining room looks wonderful! You have certainly added another layer farmhouse charm to this room! This looks wonderful! Great project! You did this yourself!!!!! You pat yourself on the back for you and me both, that looks awesome! Pinned. WOW!!! This looks outstanding my friend. It really adds sooooo much charm to the room. I am going to feature it at my party this week. What a job! This is the best DIY, I seen today. Job well done. Just catching up on my Bloglovin' and read your post. Very creative and quite innovative. Good job! It's really pretty, and I love the subtle lines vs. the in-your-face colors. Really nice!